20 Dec What is Mold Remediation? If you suspect mold buildup or damage in your home, you’ll want to act quickly to ensure that it doesn’t continue to manifest and become a bigger problem. Sure, you could attempt to do mold remediation on your own and hope that your efforts will resolve the problem. However, the real issue is that mold growth is often not visible and will likely go unnoticed. Only professional restoration companies such as IRS-Repair can properly examine and remove any mold particles that could pose another threat to your property. For mold to grow and thrive, they need a food source. Mold feeds on moisture, which may be found in or on the walls or floors of your home if moisture is present. Identifying the source of the moisture, such as water leaks or water splatter, will be able to prevent any mold growth in the future. Though not always required, check that your property’s HVAC system is working efficiently and that it is set at a cool temperature to prevent mold buildup. When mold is severely present, it can also go airborne which could warrant a damp smell and even cause sickness in humans and animals. This step involves building a containment chamber or placing a poly-sheet over the area where mold is present so that it doesn’t continue to spread once it is fully exposed. Blocking the area controls mold particles to stay within the source without the risk of releasing thousands of tiny spores that travel on air currents. The process of vacuuming allows for a thorough cleanup of larger mold particles that are present on or within the crevices of the surrounding area. Depending on the severity of the contaminated area where mold is present, all materials will be cleaned or removed. Walls and structural beams may need rebuilding if mold is found between the seams. 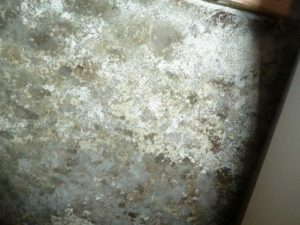 Sanding and pressure brushing might be necessary to be successful in complete mold removal. Contaminated areas will undergo a deep cleaning and thorough drying to complete the remediation process. Your IRS-Repair team will dry carpets, floors, ceilings and walls to prevent additional damage from occurring due to mold growth. The presence and removal of mold is an icky situation that should be tended to immediately by the professionals. Insurance Repair Specialists are experts in all areas of mold remediation and cleanup. The IRS-Repair team has the experience and training needed to effectively remove mold and other potentially dangerous waste from your property once and for all. We provide fast and effective mold removal and hazardous waste disposal solutions to residents of Palm Beach, Broward, and Miami-Dade Counties. Contact us today at (954) 725-2895 for more information.